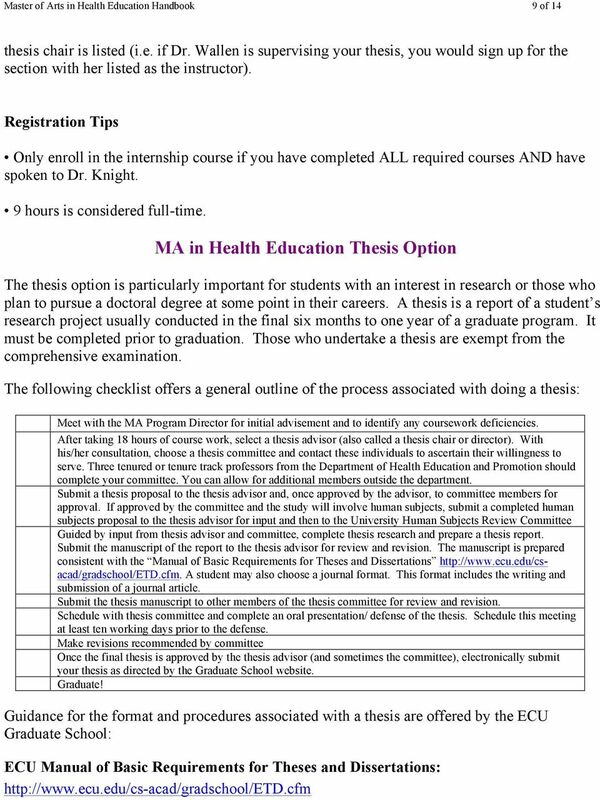 Download "Master of Arts (MA) in Health Education"
3 Master of Arts in Health Education Handbook 3 of 14 Program Description Introduction to the M.A. 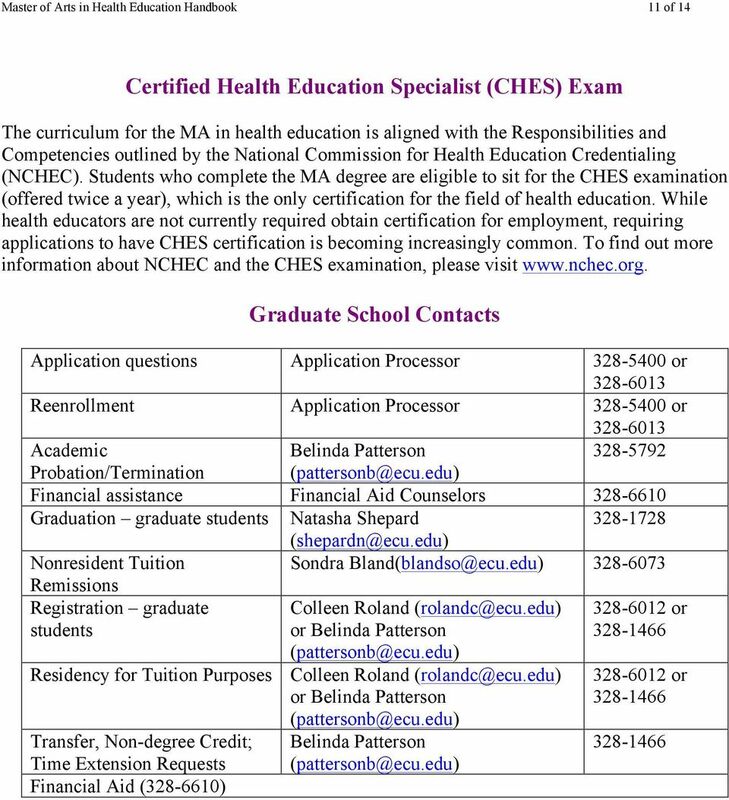 in Health Education Degree Program East Carolina University College of Health and Human Performance currently offers a 30-hour Masters of Arts in Health Education. The Master of Arts Degree in Health Education provides advanced academic training for individuals employed or planning to seek employment as health educators in academic, clinical, community, and corporate settings. The academic program requires a minimum of 30-semester hours. All students take 18-semester hours of required courses and select from one of three options: thesis, internship, or coursework. Students select electives in consultation with their advisor. This program is offered completely online. 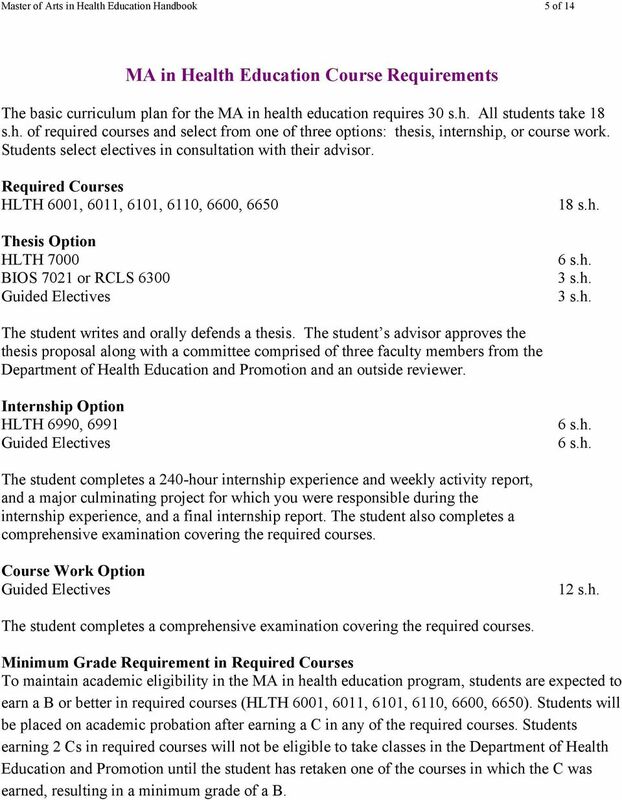 5 Master of Arts in Health Education Handbook 5 of 14 MA in Health Education Course Requirements The basic curriculum plan for the MA in health education requires 30 s.h. All students take 18 s.h. of required courses and select from one of three options: thesis, internship, or course work. Students select electives in consultation with their advisor. Required Courses HLTH 6001, 6011, 6101, 6110, 6600, 6650 Thesis Option HLTH 7000 BIOS 7021 or RCLS 6300 Guided Electives 18 s.h. 6 s.h. 3 s.h. 3 s.h. The student writes and orally defends a thesis. The student s advisor approves the thesis proposal along with a committee comprised of three faculty members from the Department of Health Education and Promotion and an outside reviewer. 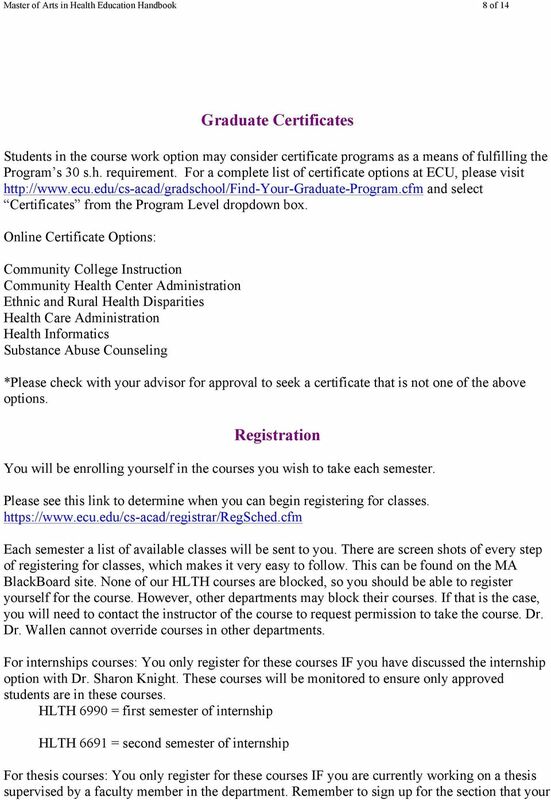 Internship Option HLTH 6990, 6991 Guided Electives 6 s.h. 6 s.h. The student completes a 240-hour internship experience and weekly activity report, and a major culminating project for which you were responsible during the internship experience, and a final internship report. The student also completes a comprehensive examination covering the required courses. Course Work Option Guided Electives 12 s.h. The student completes a comprehensive examination covering the required courses. 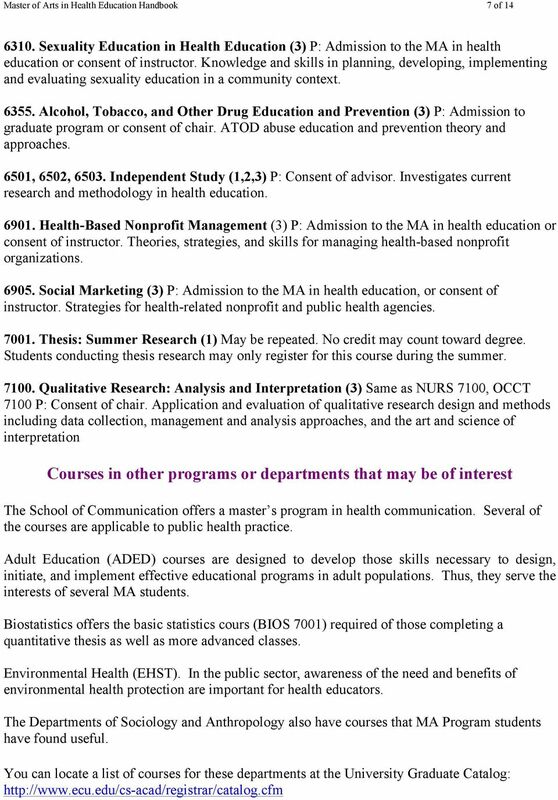 Minimum Grade Requirement in Required Courses To maintain academic eligibility in the MA in health education program, students are expected to earn a B or better in required courses (HLTH 6001, 6011, 6101, 6110, 6600, 6650). Students will be placed on academic probation after earning a C in any of the required courses. Students earning 2 Cs in required courses will not be eligible to take classes in the Department of Health Education and Promotion until the student has retaken one of the courses in which the C was earned, resulting in a minimum grade of a B. 6 Master of Arts in Health Education Handbook 6 of 14 Required Courses Foundations of Health Education and Promotion (3) P: Admission to the MA in health education or consent of chair. Health behavior theory, ethics, and the practice environment Introduction to Epidemiology (3) P: Admission to the MA in health education or consent of chair. Overview of principles of epidemiology, including major epidemiologic study designs, measures of association, clinical trials, bias, confounding, and other topics Research Methods in Health Education (3) P: Admission to the MA in health education or consent of chair. Basic knowledge and skills regarding design, implementation, analysis, and interpretation of research in health education and promotion Intervention Strategies for Health Education and Promotion (3) P: Admission to the MA in health education and promotion or consent of chair. Apply existing research and best practices in methods/strategies utilized by health education and promotion professionals Needs Assessment in Health Education and Promotion (3) P: HLTH 6001, Admission to the MA in Health Education and Promotion or consent of chair. Needs assessment planning, implementation and evaluation Evaluation of Health Education and Promotion Programs (3) P: HLTH 6600; or consent of instructor. Principles and procedures to evaluate the process and impact of health promotion/disease prevention programs in community, clinical and corporate settings. 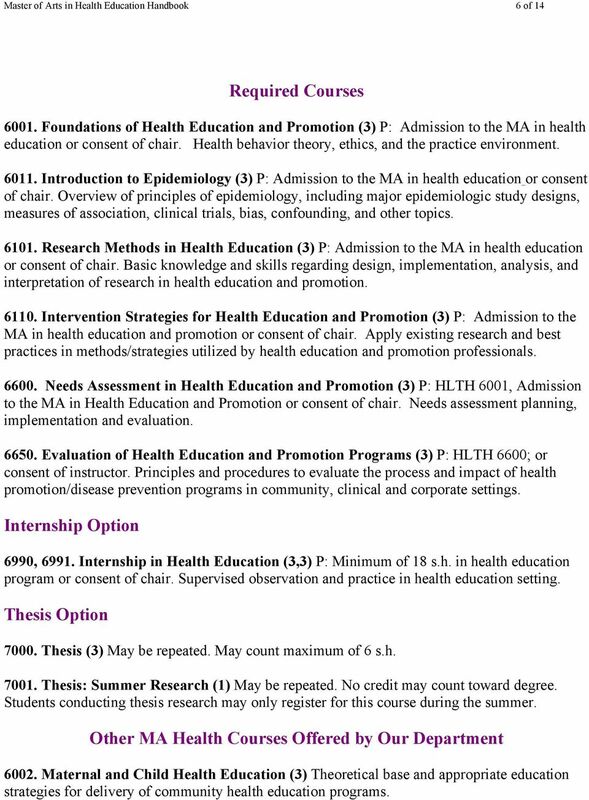 Internship Option 6990, Internship in Health Education (3,3) P: Minimum of 18 s.h. in health education program or consent of chair. Supervised observation and practice in health education setting. Thesis Option Thesis (3) May be repeated. May count maximum of 6 s.h Thesis: Summer Research (1) May be repeated. No credit may count toward degree. Students conducting thesis research may only register for this course during the summer. Other MA Health Courses Offered by Our Department Maternal and Child Health Education (3) Theoretical base and appropriate education strategies for delivery of community health education programs. 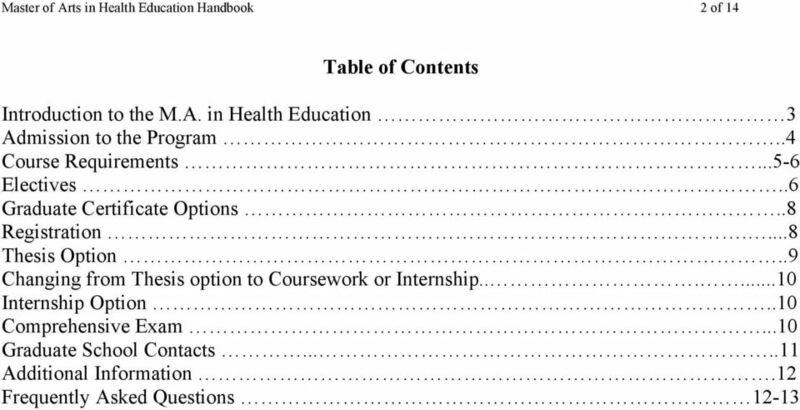 10 Master of Arts in Health Education Handbook 10 of 14 Changing from Thesis Option to Coursework or Internship In some instances, students decide to change from the thesis option to the coursework or internship option. 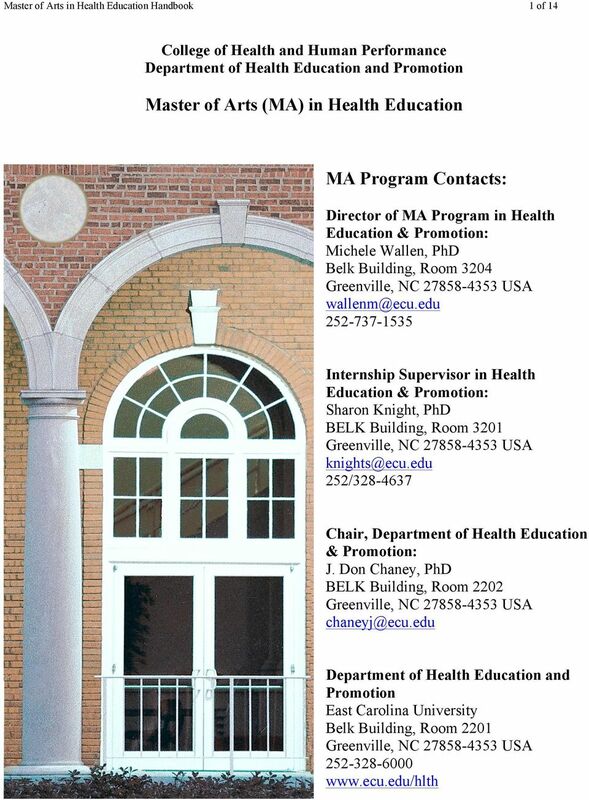 Students must contact the MA Program Director as well as complete the following form ( 3.pdf). The hours earned for thesis credit will not be counted towards degree completion and must be made up with other courses. MA in Health Education Internship Option The internship experience allows a student the opportunity to function as a health educator in a professional setting. The student needs to consider an agency consistent with their interests and ambitions for the future as well as an agency willing to mentor the student in terms of developing health education skills and competencies. Internships are valuable for those students without experience in Health Education. All students in the internship option are required to complete both HLTH 6990 and HLTH Each course requires 120 contact hours. These courses may be taken simultaneously or sequentially allowing for flexibility regarding the time period over which the 240 total hours are accumulated. Students must complete all of the program s core classes (Health 6001, 6011, 6101, 6110, 6600, 6650) prior to beginning an internship. They must also have a minimum cumulative GPA of 3.0. For more information on internships please see the MA Blackboard site. Comprehensive Examination Students selecting the Internship or Course Work Option in their MA program are required to take a comprehensive examination at the end of their degree program. Students who complete the Thesis Option are exempt from the comprehensive examination. The comprehensive examination is closed-book examination administered over the course of four hours and 15 minutes. The exam occurs in 2 parts: an objective section containing multiple choice/matching questions and an essay section. The comprehensive examination is administered three times a year and is generally scheduled during the last month of the Fall and Spring semesters and mid July. The comprehensive examination covers all required courses. The administration of this exam is subject to change from semester to semester. A study guide will be distributed during the beginning of the semester you take your comprehensive exam. This study guide is always available on the BlackBoard site for the MA in Health Education. Students may find it helpful to keep textbooks and save any course materials to review for the comprehensive exam. The comprehensive examination can be taken twice. In no case will a student who has failed the comprehensive examination be administered a second exam in the same semester in which he/she took the initial exam. If a student fails the exam twice they will be terminated from the MA Program. 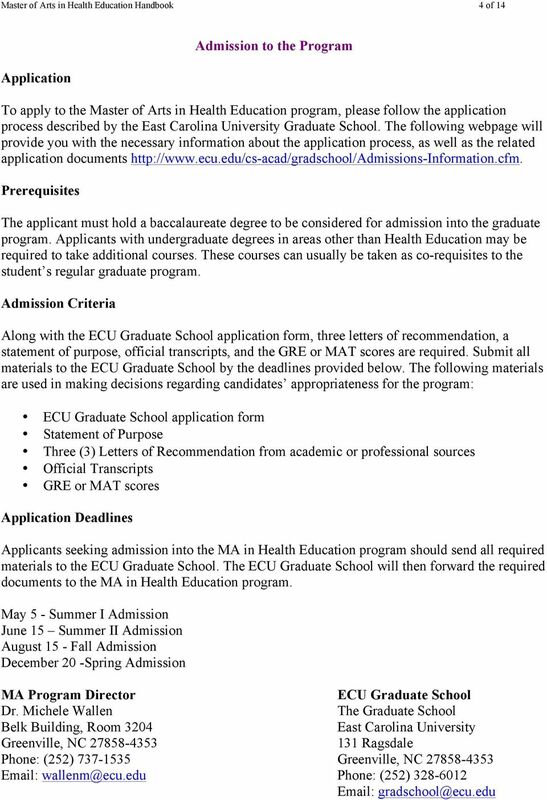 13 Master of Arts in Health Education Handbook 13 of 14 How will I know if I have been accepted to the MA Program? You will receive a letter from the Graduate School. What should I do after I receive acceptance to the MA Program? 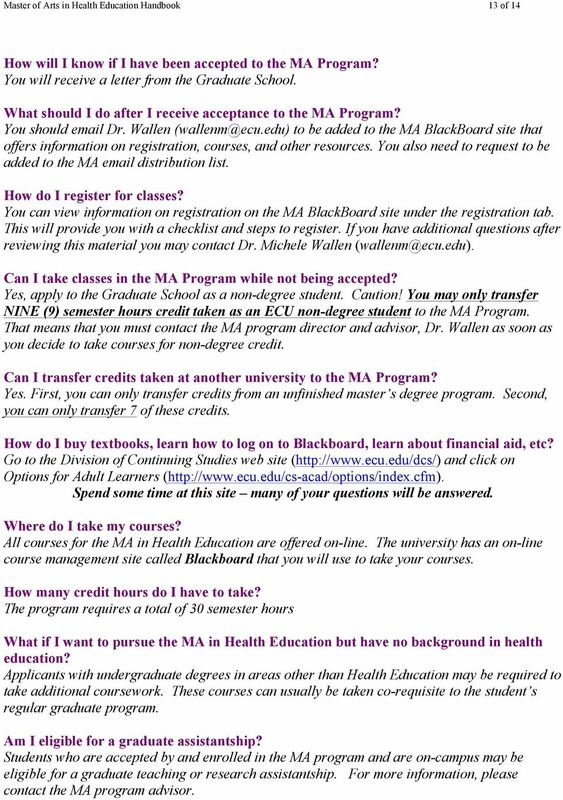 You should Dr. Wallen to be added to the MA BlackBoard site that offers information on registration, courses, and other resources. You also need to request to be added to the MA distribution list. How do I register for classes? You can view information on registration on the MA BlackBoard site under the registration tab. This will provide you with a checklist and steps to register. If you have additional questions after reviewing this material you may contact Dr. Michele Wallen Can I take classes in the MA Program while not being accepted? Yes, apply to the Graduate School as a non-degree student. Caution! 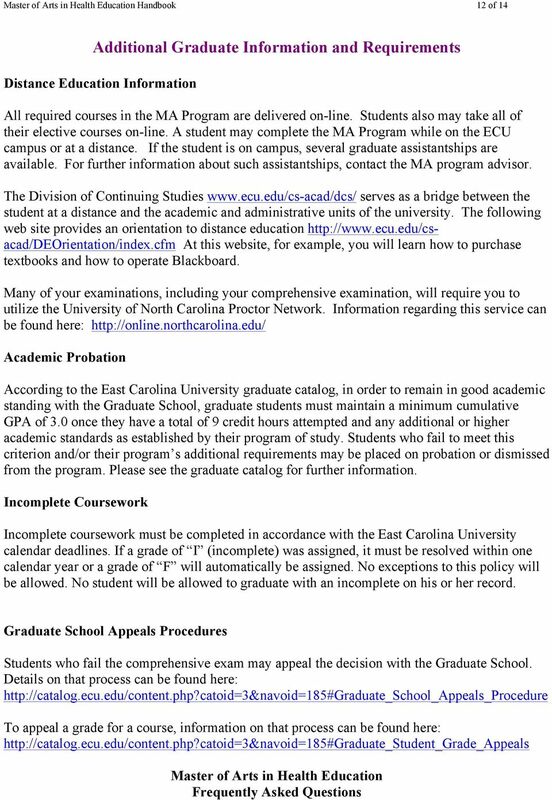 You may only transfer NINE (9) semester hours credit taken as an ECU non-degree student to the MA Program. That means that you must contact the MA program director and advisor, Dr. Wallen as soon as you decide to take courses for non-degree credit. Can I transfer credits taken at another university to the MA Program? Yes. First, you can only transfer credits from an unfinished master s degree program. Second, you can only transfer 7 of these credits. How do I buy textbooks, learn how to log on to Blackboard, learn about financial aid, etc? Go to the Division of Continuing Studies web site ( and click on Options for Adult Learners ( Spend some time at this site many of your questions will be answered. Where do I take my courses? All courses for the MA in Health Education are offered on-line. The university has an on-line course management site called Blackboard that you will use to take your courses. How many credit hours do I have to take? 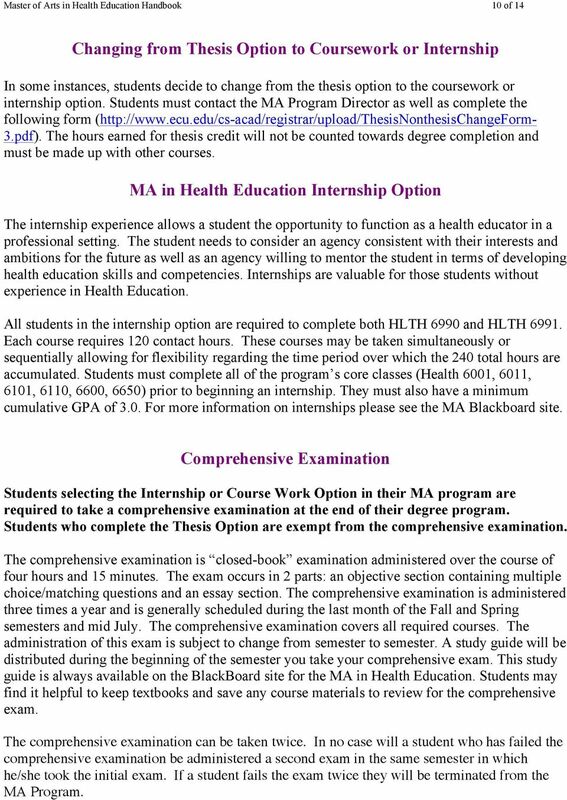 The program requires a total of 30 semester hours What if I want to pursue the MA in Health Education but have no background in health education? Applicants with undergraduate degrees in areas other than Health Education may be required to take additional coursework. These courses can usually be taken co-requisite to the student s regular graduate program. Am I eligible for a graduate assistantship? Students who are accepted by and enrolled in the MA program and are on-campus may be eligible for a graduate teaching or research assistantship. For more information, please contact the MA program advisor.